Miso Crafty Knits: Let The Games Begin! 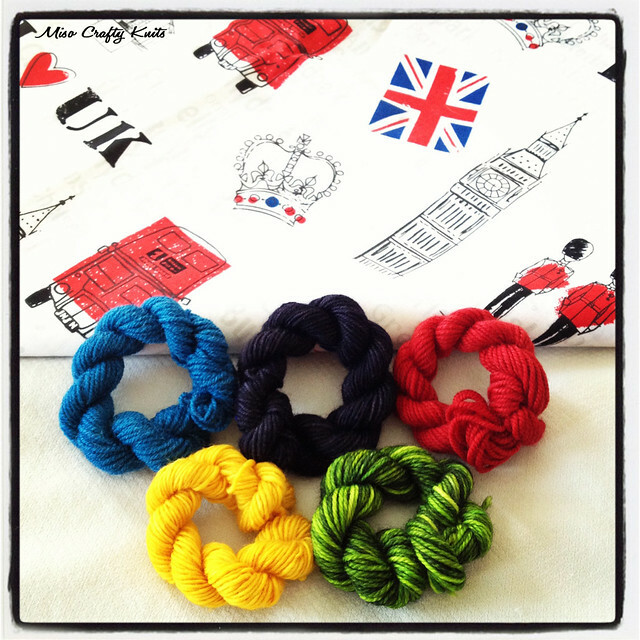 Today both the London 2012 Summer Olympics and the Ravellenic Games kicks off!! Who's planning on watching the opening ceremonies? Who's planning on knitting up a storm in the next 2 weeks? Is anyone planning on casting on something specifically for the Games? Even though I'll be watching the Olympics (I'm a huge fan of gymnastics and hoping that this year I'll be able catch some rhythmic gymnastics...but no one ever televises them! ), I won't really be participating in the Ravellenics on Ravelry. To tell you the truth I was totally unprepared. Time really snuck up on me (seriously, there's only a few days left of July? What??) and it was only last night that I discovered that the Olympics was starting today! Aiya! So I'm not on a Ravellenic team nor do I have a special project ready to be cast on. Instead, I plan on spending the next 2 weeks working away on some WIPs and decided unofficially this morning to knit as many hexipuffs as I can for my Beekeeper's Quilt. Any bets as to how many I can knit in 2 weeks? With the amount of time that I've had lately to dedicate to knitting, I'm going to say maybe a handful? I guess we'll find out!